A cross over blog from my Church, State, Faith and Culture blog. 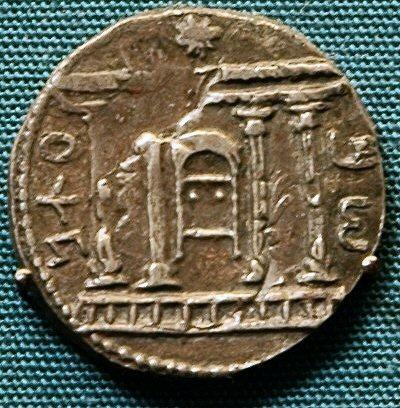 The picture of the coin is from a historical\archaeological blog I subscribe too. The coin is called a Bar Kockhba coin. Bar Kockhba led a Jewish revolt against the Romans (reign of Hadrian) in 132-136 A.D. The Romans won and the result was many Jews were disbursed throughout the Roman Empire to lessen the chances of another revolt. The coin is interesting for its messianic and eschatological symbols that include a Star of David and a rebuilt [third] Temple. The first Temple was destroyed in 586 B.C. by the Babylonians and he Second Temple also known as Herod’s temple was destroyed by Titus in 70 A.D. during the first Jewish revolt. Thus, by 132 A.D. the Jews were hoping for a messiah to rescue them from the Romans and rebuild what would have been the Third Temple.